The Stars Crusaders formed in the spring of 2014 after Davedax, Symorg and Yeda received a summons from the ancient order to unite and defend the planet from otherworld invaders. Joined together by a love of electronics and Sci-Fi, the trio has created the soundtrack to an epic adventure through the stars by blending powerful rhythms, ethereal melodies and space inspired lyrics. 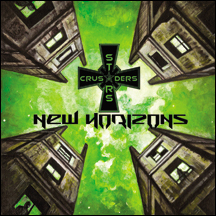 This new style of music, dubbed Electro Sci-Fi, is evident on The Stars Crusaders debut album, New Horizons. From the catchy hooks and dance friendly beats of Aeterna and In the Venusberg to the analog and kraftwerkian sounds of Supermarket Signs and Mothership, New Horizons is a journey through the galaxies of electro-pop brilliance.